I received my desired job offer today! The pay is as I expected, but the most important thing is, I’ll be working on things I like!To avoid the GST hike, I went vivocity to grab some work clothes. 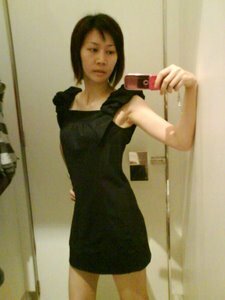 Saw this little black dress at GG>5. It’s gonna look real cute with black stockings. 😛 Anyway, it’s $100+ so I didn’t get it. I think I look really sallow in the picture. Can’t wait to eat heartily again. OMG! u look freaking skinny! as if goona blown off by the wind anytimg. pls eat more. u look HOT in this photo!!! anyway, get well soon, buddy! and gratz on ur job! ur face looked pale but love ur new figure.